Dan McPherson is doing screenings at Natural Options! Electro-dermal testing devices, such as the Asyra Pro, uses galvanic skin response (changes in the electrical resistance of the skin) to assess the state of the acupuncture meridians and therefore of the energetic health of the body. (Side note: Galvanic skin response is a well-established principle that is also used in lie detectors.) This technology also allows the practitioner, and this is where the real power of the technology lies, to assess how the body will respond energetically to a huge number of different substances. Resonance analysis is the method of sending frequencies into the body and measuring the body’s response. It is all based upon physics rather than chemistry. Physics tells us that everything is vibrating. Each substance has a vibratory signature, a unique frequency of vibration much like an energetic fingerprint. An example of this is taking a Kirlian photograph of an apple. In the Kirlian photograph you can actually see lightning type electrical frequencies coming off of the apple. Every substance is uniquely different in it’s vibration just as every substance is uniquely different in it’s chemical makeup. The Asyra sequentially sends hundreds of different resonances (foods, environmental, hormonal, pathogens) into the body and measures how the body responds to those signals. It then tells the practitioner which substances irritate the body or weaken it, or if a pathogenic signature remains in the body. A variety of signals has been developed to determine if the person is improving, remaining the same, or worsening. These signals are used as a baseline for future reference. What Happens at an Asyra Screening? Health screening with the Asyra PRO simply involves sitting in a chair and holding two small brass bars. The Asyra then uses a process called bio-feedback to test and record the body’s energetic response to various substances. There is no waiting for results and a printed report will be given to you. After meeting with Dan, you will then meet with Rhonda or Michelle to set up your Wellness plan! We all respond to our environments in various ways. If you see, taste or hear something you really like, you will think good thoughts and your body will physically respond by relaxing, producing saliva etc. If, however, you experience something undesirable you will respond very differently; tension, shallow breathing, thoughts of how to avoid it, etc. Bio-feedback is the body’s own electrical process of monitoring how your body responds to various stimuli. 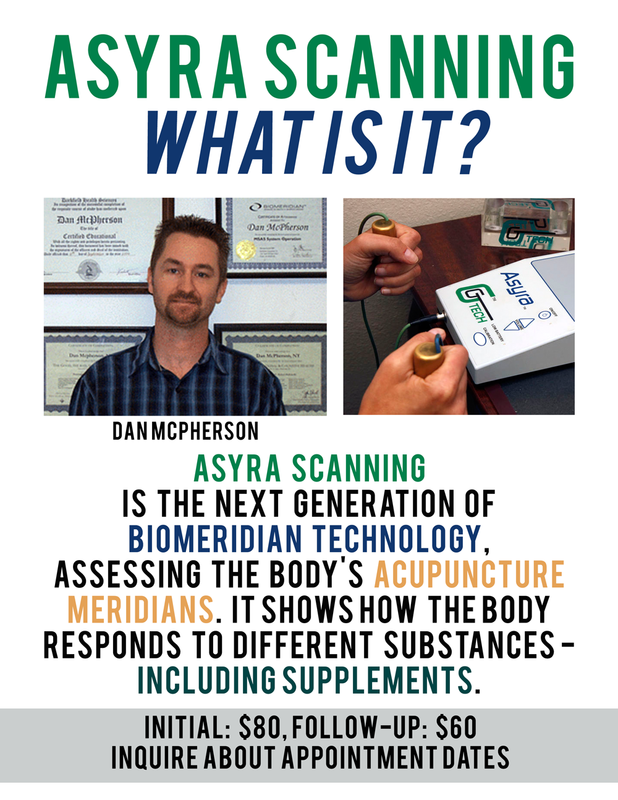 The Asyra screening simply passes different stimuli through the body and records how it responds. The results give you a clear snapshot of how your body is functioning at the time of the test, and any areas of weakness or stress. Depending on the specific tests carried out, the results may give indications of any nutrient deficiencies, toxicities, sensitivities and more.